Judy Norton is probably best known as Mary Ellen Walton, the eldest Walton, from the smash TV drama The Waltons. This show happened to be one of my favorite shows. Growing up in a small rural environment in the south, I identified with this show. I was surprised to find out that Judy has also appeared as Dolly Levi! Three times on stage AND she also directed a production of Hello, Dolly! When we sat down to discuss her memories, it was like sitting down with an old friend. The first time she appeared as Dolly was in 2003. That was with Galveston Island Musicals. 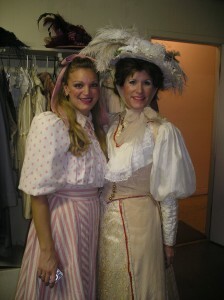 As I’ve written previously, both Marilyn Maye and Nancy Sinclair also appeared as Dolly there. Obviously, Dolly was a huge crowd pleaser and money maker there. Judy tells me it was her first job offer via e-mail. A dear friend of hers, Jack Dabdoub, who she had appeared opposite in 1984 in a production of Annie Get Your Gun. Judy was Annie and he was Buffalo Bill. Jack was a wonderful New York Broadway actor. Jack and Judy stayed in contact and over the years, he would send her these postcards. These postcards always reflected and were about the musicals he was doing in Galveston. He kept telling her how much he enjoyed working with that company and that he wanted to give them her materials. Jack felt that she would love working there as well. She sent that along and never heard anything. In 2003, she receives an email from the producer, Mike Skiles, saying that their mutual friend Jack Dabdoub had recommended her and that they were doing, “Hello, Dolly!” and asked if she would be interested in playing Dolly. Judy asked if it was an “interested check” or an offer. He said it’s an offer. She called Jack and asked if this guy was for real. She asked Jack to tell her about him. Jack said they are lovely people and that she would have a great time there. That was the beginning of it. She has had a great time with that company and that product which has now lasted eight years as a writer, actress, director. That company transformed itself into Texas Family Musicals and started doing productions in other cities.She would go on to appear as Dolly at the Grandberry Opera House in Grandberry. Last summer, she directed productions in both the Grandberry Opera House and in Lewisville, Texas. When the show moved from Grandberry into Lewisville, she went into the show as Dolly. A first, going into a show that she had directed. I asked Judy if she had ever seen Carol Channing play the role. She did not. She has met her through Harlan Boll. Judy said she was lovely, warm and sweet. She suddenly had a sense of what Carol’s appeal in the show was. She has no doubt that Carol’s performances exuded these qualities. “She is so embracive of life and people and I am sure that these people were in her audiences were blessed and must have felt as if she were holding them in her arms. She has that bigger than life presence. I remember reading an article on her once where she said when she was first approached about doing Dolly, that she insisted upon auditioning. She wanted to convince the creative team that she WAS RIGHT and that she COULD do it.” Judy has never forgotten that. “It showed a lot of integrity. I don’t know that I could be that way! I want the job.” Interestingly enough, Carol was the ONLY one of the Broadway Dollys who actually auditioned for the role. All the rest were handpicked by Mr. Merrick. Over the years, Judy’s Horaces have included Sean McGirk…”who is a fabulous actor”; he resides in the Boston area, Steven Einspar, and Jared Benn last summer. Out of these productions, the one that stands out the most is probably the first production because it WAS the first. It was really a great combination of all of the elements coming together, the director, the choreographer, the ensemble. The director, Cailin Haffernan , gave everyone a lot of freedom. She did not want to copy what had gone before. She didn’t want the cast to get locked into anything. Judy’s only frame of reference was the movie. She had never seen it done on stage prior. She happens to like the movie. She realizes that many people don’t like the movie but she is a big Barbra Streisand fan. She thought it was fun and liked what they did with it. Cailin sat down with Judy and the cast and said, “Let’s just explore these characters.” Judy felt less pressure because of that because she is not Carol Channing. She felt that it was a very challenging and daunting prospect to take on this role. Judy knows that women with very big personalities had taken on this role in the past. Carol Channing, Joanne Worley, Ginger Rogers, etc. As a performer, Judy does not think of herself that way. It does not fall into the category of roles that she is typically cast in and it scared her. “How do I find that character?” She spent a lot of time doing her homework so that she became that character rather than a caricature. That was her challenge and Cailin made her feel very safe and comfortable. She felt that there was no judgment or expectation for her to live up to some image of what that role should be. Working opposite Sean was wonderful with that great comic sense. He gave her great motivation on stage. He made it fun. Each of these runs were short lived due to the fact that they were stock and regional companies. Sometimes just one or two weeks. Each time the opportunity presented itself again, she could now come in and say this is now familiar yet new. Cumulatively, it feels like I’ve done a long run of Dolly! Traveling, there are pros and cons to being away from home. Obviously, you don’t have the comfort of going home after a long day and being with your family. Living on the road can be lonely. Your life sort of stops in many ways. That’s difficult. Your focus is locked into the project that you are working on at that moment. For the shorter runs, that’s fine. You’ve barely gotten out of rehearsals, when 24/7, you have to be focused on the show for that production. When it is a longer run, you begin to twiddle your thumbs with “What am I going to do now” during your “down time”, especially in a town that can be explored in fifteen minutes. Being a writer, Judy devotes a lot of that time to her writing. In those situations where Judy is directing, there’s less time for that. A director’s day is much longer than an actor’s. Again, her focus ends up being on the show and less on her. She doesn’t have those thoughts running through her head that she is dropping the ball as a wife and a mother, that dinner isn’t on the table, my son needs to go here or there, etc. There’s none of that pressure weighing down on her of her trying to handle everything as she normally does. Directing takes away a little bit of that pressure and makes it easier for her in terms of being on the road. One night when Judy was playing Dolly, during the “I Put My Hand In” sequence when she is speaking with Ambrose and sending him out to get tickets for the train, something happened. In that sequence, Dolly sends him out a couple of times. He keeps coming back with different excuses. He runs off and she is the only one on stage and she goes completely blank! She had no idea what was coming next! These mere seconds on stage felt like hours! She stood there questioning why she was there. Was she supposed to be talking or singing? There’s a tag on the song, “I twist a little, stir a little”…maybe that was what she was supposed to be doing! Perhaps she was standing on the wrong side of the stage! The track was orchestrated in a way for Dolly to speak/sing her way into that tag. It’s just a bell tone. She started to sing very slowly the beginning of the tag. No music came on! Instead of the sound person realizing what was happening and following suit, and skipping to that moment, he didn’t. Judy realized it wasn’t the right spot for the tag. She stood there thinking “Obviously, I’m not supposed to be singing; what am I supposed to be saying?” This whole sequence probably was all of 10 seconds but felt like ten minutes. Judy was all alone and left to her own devices. Judy doesn’t remember what she said that got her on track, but the muses intervened and she proceeded as usual. It wasn’t “deer in the headlights”. Judy is very comfortable on stage, so when that happened, she didn’t panic. Since performing as Dolly, Judy has only seen one other production of Dolly. An older comedic actress but not well known. Working on Dolly gave Judy a whole new way of doing her homework to prepare for a character. Doing television, you end up, most of the time, playing characters that are much closer to your comfort zone. For Judy, she goes in and ends up auditioning well for those. Those are easily in her “tool kit” and she has no trouble pulling those off. She feels that her strength is in certain types of roles. Dolly being more “out there” and through her exploration was able to discover that any character is in her given different “life circumstances”. What would Judy’s life circumstances need to be in order to play that character? What would have to happen for her to do the things Dolly does or acts the way she does? In finding that and understanding that for her, as an actress, and making that as big as she wanted it to be for her has served her well in going forward with her career. She feels that there are no longer limitations that she had previously put on her as an actress. Having done the show as an actor, Judy knew as a director that there were certain elements that you must adhere to within the framework of the show. Judy also serves as an acting coach and helped each of the actors find what worked best for him or her instead of what was pasted on. She likes for herself as an actress and as a director to find what is “real” in the characters. No matter how big these characters are, they are real people. She prefers that they not just go for the comedy, but rather to just go for the truth and reality. What’s driving them? Her goal as a director was to get to that core. She had great actors that were willing to take that journey with her and she was able to bring some truth to these characters. I also wanted to know what major changes Judy has seen in the industry since she first made her debut. She feels, unfortunately, that it is being pulled further and further from the “art” to business people who are running the show. It is now more about dollars and cents rather than the creative. “When a creative area is being dictated more by bean counters, the craft and the product suffers.” Judy understands the economics of “you gotta make money”. She really tries as a writer and as an actress to be aware of those concerns. She also feels that you do the best darn production you can on stage and on screen within the budget you are given. When she was doing Dolly during one of her productions, they had practically no set. She looked at her choreographer and said, “We are creating a great show! They sing well. They dance well. The story moves. People aren’t going to notice that there isn’t a big multi-million dollar set. If the audiences are worrying about the set, we didn’t do our job.” Judy feels that as an artist, she is trying to tell stories and move people. She feels that when it becomes just about making money, you lose that. She would rather have less money on a nice project where it can find its audience of people who like it as opposed to worrying about something having to be a blockbuster where you have to hire a name” that isn’t right for the role but everyone will come out to see that name. Maybe they can’t act or sing, but they’ll sell tickets. It’s also problematic when there are too many cooks or committees. When she was doing The Waltons, as the seasons progressed, the network brass became more and more involved in every minute detail of production. The creative people ended up having their hands tied as to what they could or could not do because someone new was now saying something could no longer be done. “You can’t hire THAT person. You must hire THIS person.” It really has hurt the industry. 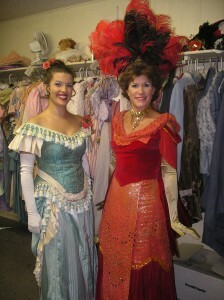 In closing, Judy says “Hello, Dolly!” is just one of those shows that audiences LOVE. No matter the production, it always works. It is a show with a lot of heart and it always amazes Judy how well it still holds up almost fifty years later. AND it is fun to do. She doesn’t know if there is more Dolly in Judy’s future but one can always hope. Once she is there, she is ALWAYS there!